The ability to predict the end of life on Earth is a mixed blessing for Jules (Nicholas Pelczar), a character in Boom, the new play by San Francisco playwright Peter Sinn Nachtrieb, who was raised in Mill Valley. BOOM opened at Marin Theater Company on Tuesday November 17th. The awkward marine biologist believes he has incontrovertible evidence because the fish he studies seem to sense an impending disaster undetectable by humans. He plans to be prepared to repopulate the planet by placing an ad online to find a suitable mate. The advertisement is answered enthusiastically by Jo(Blythe Foster). Unfortunately, Jo and Jules are about as compatible as oil and water, and once the disaster actually happens they find themselves trapped in his underground lab with a weird collection of supplies: Clif bars, tampons and disposable diapers. It’s an intriguing premise, but Nachtrieb pushes it even farther. The playwright has created a frame for this tale that involves a third character, Barbara (Joan Mankin), who has some strange power over what’s happening to Jo and Jules. It becomes evident in ways that some will find amusing, while others might be annoyed or confused at how the couple’s plight and ultimately Barbara’s plays out. Nachtrieb has a good ear for contemporary dialogue, and the actors throw themselves into this absurdist tale with manic energy, as directed by Ryan Rilette. There is a message within Boom, one that can be taken in an oddly optimistic way. But to say more would give away some of the humor, so you’ll have to see for yourself. 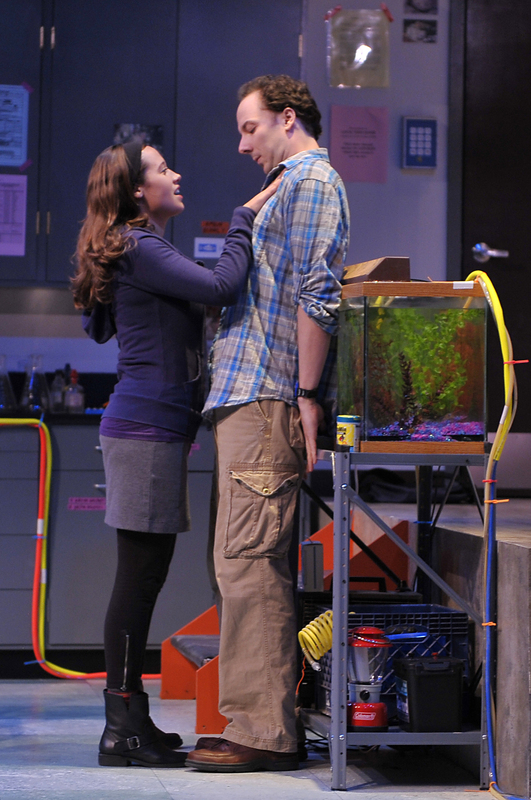 Boom is cleverly staged (the “cast” includes several fish) and assorted percussion instruments and other sonic dimensions that add to the play’s humor. Nachtrieb is a witty writer, although his skill feels a tad overworked in this show. The scenic design by Erik Flatmo is a very correct and very functional. The costumes by Callie Floor are very appropriate. Michael Palumbo has designed lighting that adds considerably to the play. The work of Chris Houston is a key part of the production, his sound and music is important to convey the situation the Jo and Jules are in. This play is for mature audiences. • Tues, Thur, Fri, and Sat at 8:00 p.m.
• Wed at 7:30 p.m. • Sun at 7:00 p.m.
• Matinees: Thur 1:00 p.m. | Sat and Sun 2:00 p.m.